Vegan New England Clam Chowder – Just in Time for Super Bowl! 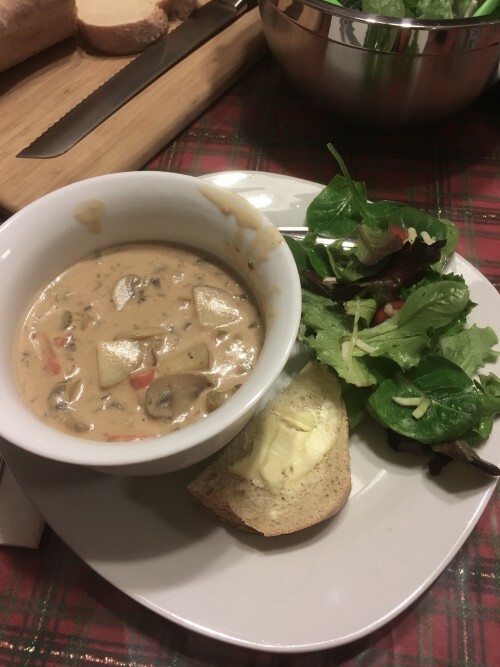 Summary: Here is a vegan and gluten-free New England Clam chowder recipe (which still has that requisite 'taste of the sea' flavor), just in time for Super Bowl LII (which is Roman numeral speak for '52')! Here is a vegan and gluten-free New England Clam chowder recipe (which still has that requisite ‘taste of the sea’ flavor), just in time for Super Bowl LII (which is Roman numeral speak for ’52’)! On Sunday, February 3rd, the New England Patriots face off against the Los Angeles Rams for the Patriots’ record-breaking eleventh time at the Super Bowl (so far they are 5 and 5). Tom Brady himself has played in an unheard of 9 Super Bowls. Whether you are a Patriots fan, or just attending a Super Bowl party without an allegiance to a particular team, this vegan New England clam chowder is sure to please even the pickiest of seafood and chowder lovers! This vegan New England clam chowder recipe is a riff on vegan goddess Isa Chandra’s recipe, simplified and still delicious! Make it at home first, if you want to test it, but we are sure you will want to bring it along to your Super Bowl party, as well as serve it often at home! In a large, heavy pot, saute the onions, carrots, celery, and mushrooms on medium-low to low heat, until onions are translucent and the other vegetables are just barely softened. Add the potatoes, the 3 cups of vegetable broth, nori, and salt and pepper. Bring to a boil, then lower heat, cover, and simmer until the potatoes are just turning tender. While the soup is simmering, put the vegan milk, 1 cup of vegetable stock, and the cornstarch in your blender, and blend until very well blended. Stir the milk mixture into the soup, and simmer uncovered for another 5 to 10 minutes, until thickened to where you want it (which will be accomplished by the cornstarch). *Make your own cashew milk: Soak 1 cup of raw cashews in water to cover for 2-3 hours. Drain and put in blender with the 2 cups vegetable stock and 4 teaspoons cornstarch and blend the heck out of it until very smooth. Vegan New England Clam Chowder - Just in Time for Super Bowl! Here is a vegan and gluten-free New England Clam chowder recipe (which still has that requisite 'taste of the sea' flavor), just in time for Super Bowl LII (which is Roman numeral speak for '52')!